So you've decided to homeschool your children. Or maybe you're still just considering it. You may be feeling overwhelmed at where and how to begin. Well, you've come to the right place! Below I've compiled and organized research on where to begin the process. You'll also find valuable links to Islamic educational resources that you may find useful on your Islamic homeschooling journey in our free Islamic Homeschool Quick Guide PDF. First things first—what is homeschooling? The most common question I receive by e-mail is: what is Islamic homeschooling? In the simplest form, homeschooling is the act of educating your children at home, rather than an institutionalized school system such as a public or private school. When I refer to Islamic homeschooling, I mean the act of teaching your children at home while incorporating the beliefs and values of Islam in everything you do. How, where, and what you choose to teach your children is at your discretion. People choose to homeschool for various reasons. My personal decision was two-fold. To an extent, homeschooling allows me to monitor Laylah's social interactions. It is easier to encourage meaningful interactions with like-minded Muslim families, and I don't have to subject her to the inappropriate behavior and language that arises in public schools. Homeschooling also allows me to work with her on an individual basis. The sheer volume of students in public and private schools often make it difficult for the teacher to address individual problems or appropriately challenge students who are grasping the material more efficiently than others. Know the laws, know your rights. Is a letter of intent to homeschool required? This may only be a necessary step if your child has previously been attending public school. If a letter of intent is required, you may use the template in our free Quick Guide to draft your own. Bear in mind the requirements of your own state as you edit the example provided. Is there a minimum number of “school” hours that must be completed each year? Are there certain subjects I'm required to teach? What qualifications, if any, do I need to teach my child at home? Do I need to keep a portfolio of my child's work and test scores? Is there any form of formal assessment that must be completed? You can find answers to all of these legalities on your state's Department of Education website. I found mine through googling “NJ Department of Education homeschooling”. If you are unclear of the explanations provided by the website, be sure to contact someone from the state directly to clarify. You'll find a summary of each state's laws in our free Quick Guide PDF, as well as, homeschooling laws for countries other than the US. Once you are clear on your local laws, you can begin to contemplate the method you'd like to use in teaching your children. Below, are a few well-known methodologies you may draw inspiration from taking into account your children's individual learning styles (learn more about discovering your child's learning style from an earlier post I wrote here). If one sounds appealing to you, do some of your own further research, but more importantly, test it out. You won't know what works for your family until you try it. Montessori: The philosophy of allowing children to learn through all five of their senses while nurturing their individual interests and providing freedom and independence within appropriate limits. Traditional: This method is essentially a replication of school, as we know it, within the home. Children follow a standard curriculum and grading system. Charlotte Mason: The philosophy that children should be respected and taught as a whole individual, and “education is an atmosphere, a discipline, a life”. Unschooling: The child-led approach to learning where there is no formal instruction, and children are free to explore their interests and passions at their will. Classical: The philosophy of education involving three major stages—grammar, logic, and rhetoric. Eclectic: The method of taking pieces from various styles of teaching to create a unique experience. Find more information on these popular education philosophies, as well as, a few others in our free Quick Guide PDF. I highly suggest creating a mission statement. This statement—be it a sentence or a few paragraphs, will provide the skeleton and framework for which you make your decisions. It will help guide you in accomplishing your long-term homeschooling goals and motivate you through the difficult times. I've compiled more information for you on what a mission statement is and an example of one in the Islamic Homeschoolers Quick Guide that you can get here. Your schooling schedule will develop through trial-and-error. You may choose to do formal instruction for a few hours every morning or have no formal instruction at all. There is no set timeframe or schedule that your family must adapt to, and a routine that is working one year, may not be feasible the next. Remain flexible, consult with those who have more experience, and experiment and adjust accordingly to what works best in your household. Download our free Quick Guide PDF for more organizational videos, tips, and printable homeschool planners. You may decide to buy and follow a full curriculum, register your child for online courses, use free resources from the internet and library, purchase resources you've strewn together, or a mix of everything. While the extent of lesson planning you do is up to you, it's ideal to at least have an idea of the concepts you'd like to introduce and work through for the year. This will help guide your weeks and give you an idea of the learning materials you will need to achieve your goals. 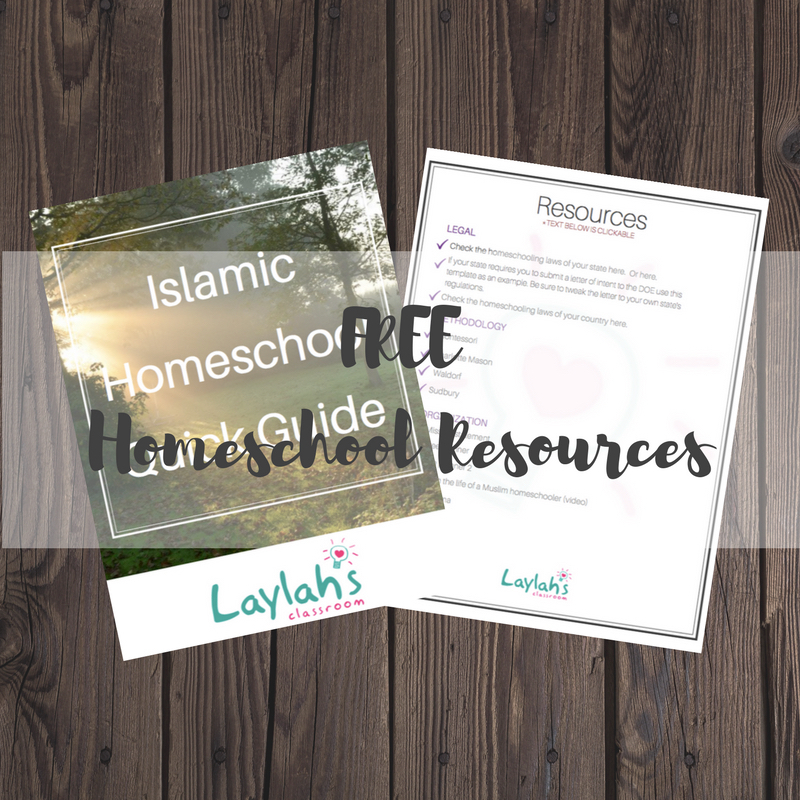 You'll find a list of valuable resources suitable for your Islamic homeschool in our free Quick Guide PDF below. May Allah (SWT) keep you steadfast on your homeschooling journey. Ameen. 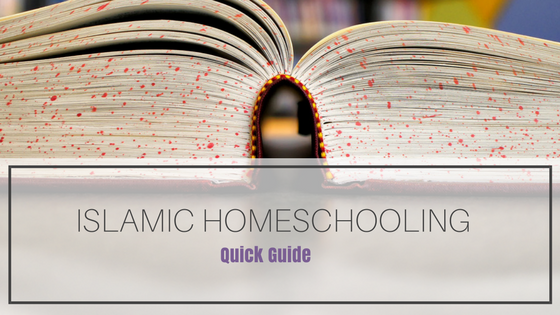 Over 40 of our favorite, invaluable resources covering 7 crucial categories, in ONE guide, to start your Islamic Homeschool off right! Success! Now check your email to confirm your subscription and receive your Quick Guide!